There is something about growing my own food that I love. I relish the taste of a real, garden-grown, red, ripe tomato – whether it’s tossed with my salad, cooked into sauce, or eaten right off the vine, all warmed by the sun. I find great satisfaction in going out to the garden before dinner to see what looks good tonight – the beans or the zucchini or the broccoli. I love digging potatoes in the late summer days, searching for those Yukon golds in the dark dirt of my garden. I have no illusion that I could live off the land. I grow my own food in the summer, but I’m not much good at canning it – and even if I were, I’ve a long way to go before what I grow would sustain my family for more than a couple of weeks after the garden is put to bed for the long Franconia winter. Nor could I survive, if lost in the woods, by foraging on wild foods, because I have no idea which roots or mushrooms or leaves are safe to eat and which would kill me. I have no intention of ever raising animals for meat. Chickens for eggs I consider all the time, but I doubt I’ll ever convince my husband that it’s a good idea. But meat, no. My brother and his girlfriend, over the course of two summers and autumns, have raised three pigs. They’ve fed them and scratched their backs and watched their quirky pig antics and given them a comfortable life. And they’ve butchered them with the help of friends when it’s time to fill the smokehouse and the freezer. My mother tended a large backyard vegetable garden when I was a kid – rows of green beans and yellow, carrots, corn, zucchini and summer squash and butternut, potatoes and beets. I grew up eating fresh vegetables all summer and home-grown frozen ones into the winter. I remember my brothers and me loading a little red wagon with an overabundance of veggies and carting them through the neighborhood, selling squash and cucumbers for pocket change. My brother, as a small boy, grew the biggest and best tomatoes around. In college I would return, after a school year of dining hall food, to the garden freshness of home. Then I moved to Colorado, and there was no garden in the high mountain town where I lived, and where it is not unusual to see snow in summer. My roommates and I planted pots of flowers, but no food. When the travelling farmers market was in town, I’d happily bike over and buy a few items. It took me a few years after moving back East to build a garden of vegetables. I consider myself a novice and learn a little bit each growing season. I try to add something different to the garden each spring. This year we discovered a wide and thriving patch of blueberry bushes in the southeast slope of the field. I could spend hours there picking those small, dark, sweet berries, and we’ve been packing them into muffins and pancakes – and the freezer for later. In the fall we gather apples from our gone-wild trees and the tamer one with the wide branches at my in-laws’ house. These, we eat fresh or press into cider. In the late winter we tap maple trees and boil the sap into one of New England’s best food products: maple syrup. My husband and his brother and their father made syrup the old-fashioned way when the boys were boys. They collected sap in buckets and fired the evaporator with hardwood, sitting at the sugarhouse for the long hours it took to cook the sap down. A few years ago my father-in-law had a beautiful new sugarhouse built, and modern plastic tubing strung through the sugar orchard to collect the sap. But sometimes we just make a few gallons in our driveway, using the turkey fryer and a big soup pot. It’s all hard work. And in the end, the syrup tastes just as sweet, and – despite the cost of propane used to heat the pot – costs less the $20 per pint at the grocery store. Sometimes, food just tastes better when you grow it, or make it, yourself. Obviously my carbon footprint – a catchphrase for those of us who like to think we are gentle to the earth – is smaller when I go to my backyard for vegetables instead of to the grocery store 2 miles or 7 miles away, where the food comes from even further afield – sometimes the farm down the road, often a country across the globe. But that’s not why I plant a garden each spring. I plant the garden because it feels good, after a long winter, to dig in the muck. Pulling the weeds and tilling the soil by hand and adding compost and forming rows is hard work, but it is good work. Planting seeds and willing them to grow – not knowing if we’ll have a late frost or a wet summer or a local drought or an infestation of those annoying green caterpillars that eat broccoli leaves – is an act of hope and faith. I plant a garden because my mother did – still does – and I hope that someday, when they are grown, my children will, too. I plant a garden because vegetables grown there taste more real, like sunshine and earth, than the ones you buy under florescent lighting. 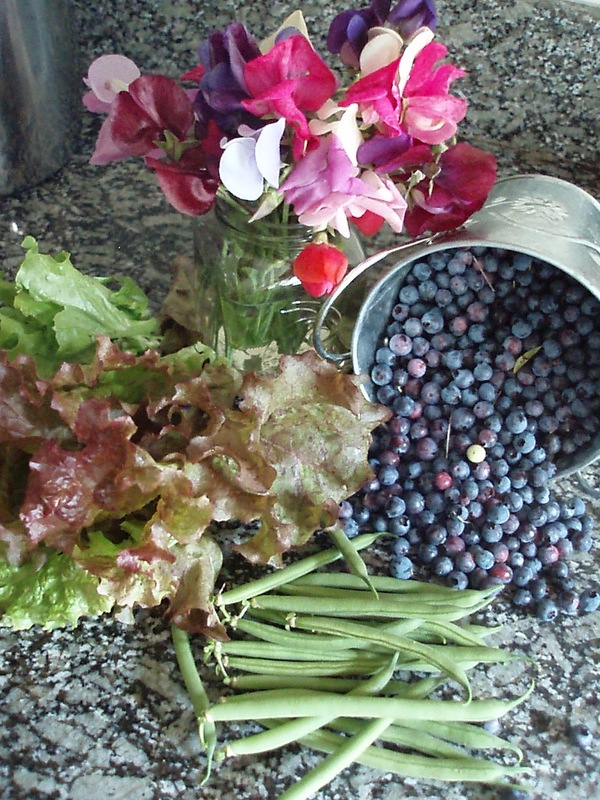 I plant a garden – and harvest wild berries – because months from now, when the days grow colder and darker, there will be something tucked away in the freezer – green beans or blueberries or pesto – that will still taste like summer. I plant a garden because it brings me joy. Last weekend Franconia held its annual Old Home Day celebration, which this year feted the 100th anniversary of the town’s beautiful Abbie Greenleaf Library. Just up the road, Sugar Hill is celebrating 50 years as an incorporated town, with much discussion of its history – as a town reaching the ½ century mark and as a community with families and stories that reach back to the 1700s. Both events highlight the importance of local resources. Not the natural resources that draw both residents and visitors to this beautiful neck of the woods, but the kind that are more rarely discussed – our libraries and museums, whose stature is small, but whose import to the local community is immeasurable. These are the places we go when we have questions that cannot be answered via a Google search. They are the places we visit to see how our towns looked 100 years ago, find out who came before us, or discover what grand building once stood at the top of those elaborate but now overgrown stone steps leading seemingly to nowhere. Libraries offer much more than borrowed books. They are a place to find information of all sorts, to sit quietly and read, and sometimes to access the Internet – a big deal in a place where many folks are still stuck on dial-up connections at home. Larger libraries, like Littleton’s, also have microfilm of local newspapers covering several decades, along with other historical resources. These can be a boon to people conducting research, but they’re also a kick to look through, revealing enticing glimpses into bygone days. As a resident of Franconia, I often visit the Abbie Greenleaf library, built the same year as Fenway Park. 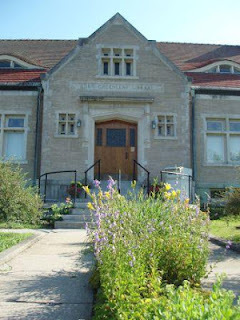 The building is well kept and the gardens out front are a glorious assortment of colorful blooms through the summer. But the real treasure is inside, where the librarians can point you in the direction of well-worn history tomes or the latest reading sensation – or offer a suggestion if you just don’t know what you want. Likewise, our area’s museums are treasure troves of local history, revealed through photographs, personal notes, and carefully considered exhibits. While searching for one thing or another in our local museums, I have discovered unexpected gems. It is here that I found the glorious Profile House which once reigned in splendor over Franconia Notch. It is here, too, that I gained important insight into the later development of Cannon Mountain as a ski area. And it is here that I learned that as successful a poet as Robert Frost became, he was not much for farming, despite keeping a cow in his Franconia barn. Over the years, for various stories and projects, I have turned to several local resources – the Franconia Heritage Museum, tucked into a former residence gifted to the town; the Sugar Hill Historical Museum occupying a neat, bright building and adjacent carriage barn in the center of town; the Littleton Historical Society’s museum nestled into the lower level of that town’s Opera House; and the NewEngland Ski Museum, housed in a tiny building and former maintenance shed at the base of Cannon Mountain’s tramway. These museums range from all volunteer staff to full-time employees. Some are open a few hours during summer weeks, others nearly year-round. All hold information in the form of scrapbooks, photographs, interview transcripts, books and newspaper clippings and little tidbits of information tucked here and there that together paint a picture of our region’s history – its people and commerce and changing landscapes. Usually, these small museums (and municipal libraries) operate on shoestring budgets. Many rely heavily on meager membership fees from a core of interested supporters to keep the doors open and the bills paid. If you haven’t visited your local library or museum lately, I encourage you to do so – and to support it however you can. You never know what you might discover. A version of this essay appears in this week’s edition of the Record Littleton.